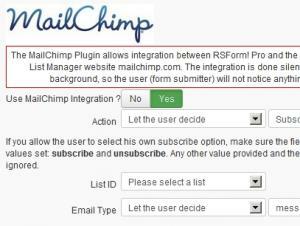 The RSForm!Pro - Mailchimp Plugin allows you to integrate your custom newsletter forms with the email-marketing manager. With this integration you will be able to create subscription forms, pass users data to your Mailchimp account and assign them to the existing lists and groups. The RSForm!Pro - MailChimp is a plugin that once installed and enabled will allow you to create custom subscription forms for the email-marketing manager. In this tutorial, you will learn how to install the plugin, then how to set up your MailChimp integration. In order to download the RSForm!Pro - MailChimp Plugin you must have at least one active code of RSForm!Pro. Simply go to the My Downloads section of our website (You must be logged-in in order to see the My Downloads section). In the list of downloads go to the RSForm!Pro section, and download the RSForm!Pro - MailChimp plugin. 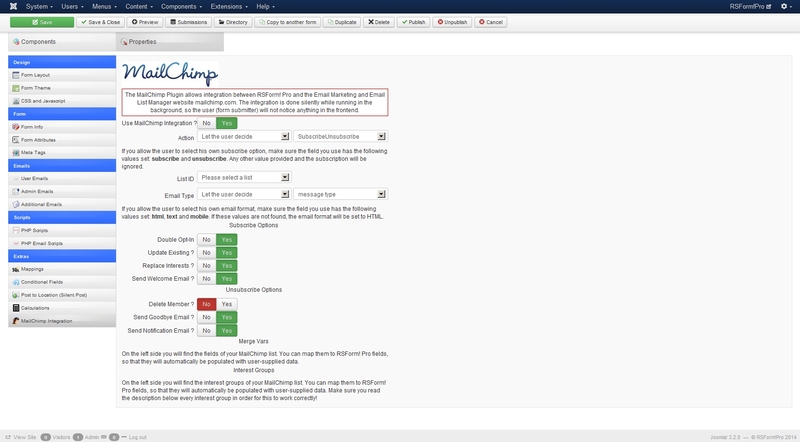 The RSForm!Pro MailChimp Plugin should auto-publish itself, but if that doesn't happen, you can go to Extensions / Plugin Manager and enable it. The plugin is located in the System group and you can identify it by the name of "System - RSForm! Pro MailChimp"
Once you have enabled the plugin, go to RSForm!Pro » Manage Forms and edit the form where you want to use the RSForm!Pro - MailChimp Plugin. You will notice that one more tab has appeared. In order for the plugin to work you will have to enable it from Extensions > Plugin Manager, enter your MailChimp API key in Components > RSForm!Pro > Configuration > MailChimp and then set the plugin parameters. map the form components to your desired list fields for the "Merge Vars","Interest groups" sections. 20 persons found this article helpful.